Many polymath projects will be proposed, planned, and run at [http://polymathprojects.org/ This Blog]. A Polymath [[logo]] is being trialled. If you have more suggestions, please add them to the [[logo]] page, or add to the discussion at [[Talk:logo]]. * [[Polymath1]]: New proofs and bounds for the density Hales-Jewett theorem. Initiated Feb 1, 2009; research results have now been published. * [[Definable Banach Spaces|Polymath2]]: Must an “explicitly defined” Banach space contain <math>c_0</math> or <math>l_p</math>? Initiated Feb 17, 2009; attempts to relaunch via wiki, June 9 2010. * [[imo 2009 q6|Mini-polymath1]]: Solving Problem 6 of the 2009 International Mathematical Olympiad. Initiated July 20, 2009; five proofs obtained so far. * [[The polynomial Hirsch conjecture|Polymath3]]. The polynomial Hirsch conjecture. Proposed July 17, 2009; launched, September 30, 2010. * [[finding primes|Polymath4]]: A deterministic way to find primes. Proposed July 27, 2009; launched Aug 9, 2009. Research results have now been published. * [[The Erd&#337;s discrepancy problem|Polymath5]]: The Erd&#337;s discrepancy problem. Proposed Jan 10, 2010; launched Jan 19, 2010. Activity ceased by the end of 2012, but results from the project were used to solve the problem in 2015. * [[imo 2010|Mini-polymath2]]: Solving Problem 5 the 2010 International Mathematical Olympiad. Proposed Jun 12, 2010; launched and solved, Jul 8 2010. * [[Improving the bounds for Roth's theorem|Polymath6]]: Improving the bounds for Roth's theorem. Proposed Feb 5, 2011. * [[imo 2011|Mini-polymath3]]: Solving a problem from the 2011 International Mathematical Olympiad. Proposed Jun 9, 2011; launched and solved, Jul 19, 2011. * [[imo 2012|Mini-polymath4]]: Solving a problem from the 2012 International Mathematical Olympiad. Proposed, Jun 3, 2012; launched, July 12 2012. * [[The hot spots conjecture|Polymath7]]: Establishing the Hot Spots conjecture for acute-angled triangles. Proposed, May 31st, 2012; launched, Jun 8, 2012. * [[Bounded gaps between primes|Polymath8]]: Improving the bounds for small gaps between primes. Proposed, June 4, 2013; launched, June 4, 2013. Research results have now been published. * [[Discretized Borel Determinacy and P=NP|Polymath9]]: exploring Borel determinacy-based methods for giving complexity bounds. Proposed, Oct 24, 2013; launched, Nov 3, 2013. * [[The Erdos-Rado sunflower lemma|Polymath10]]: improving the bounds for the Erdos-Rado sunflower lemma. Launched, Nov 2, 2015. * [[linear norm|Polymath14]]: Classifying homogeneous norms on groups. Initiated Dec 16, 2017. Results submitted, Jan 11, 2018. * Scott Aaronson's "philomath project": "[http://scottaaronson.com/blog/?p=453 Sensitivity vs. Block sensitivity]" (see also [http://mathoverflow.net/questions/31482/the-sensitivity-of-2-colorings-of-the-d-dimensional-integer-lattice this Math Overflow question]). Launched Jul 13, 2010. * A wiki page clearinghouse for the [[Deolalikar P vs NP paper]]. Launched Aug 10, 2010. * <del>[http://researchtrends.wikia.com/wiki/Main_Page Math Research Trends Wiki] "research in the middle"</del> This project is recommended to be discontinued in favor of <b>[https://conference.portonvictor.org/wiki/Research_in_the_middle Research in the middle project] at [https://conference.portonvictor.org Virtual scientific conference]</b>. * The page for the [[ABC conjecture]] contains links and information about Mochizuki's claimed proof of this conjecture. * [http://gilkalai.wordpress.com/2009/03/25/an-open-discussion-and-polls-around-roths-theorem/ The cap set problem]. Proposed March 25, 2009 (see also these [http://gilkalai.wordpress.com/2009/05/11/around-the-cap-set-problem-b/ two] [http://gilkalai.wordpress.com/2009/05/18/the-cap-set-problem-and-frankl-rodl-theorem-c/ followup] posts). * [[Boshernitzan’s problem]]. Proposed July 27, 2009. If you have a tentative proposal for a polymath project, you can either make a post on it on your own blog, or place it [[other proposed projects|here]]. * [http://gowers.wordpress.com/2009/01/27/is-massively-collaborative-mathematics-possible/ Is massively collaborative mathematics possible?] Tim Gowers, January 27, 2009. * [http://lucatrevisan.wordpress.com/2009/02/01/a-peoples-history-of-mathematics/ A people's history of mathematics] Luca Trevisan, February 1, 2009. * [http://michaelnielsen.org/blog/?p=553 The polymath project] Michael Nielsen, February 3, 2009. * [http://www.neverendingbooks.org/index.php/yet-another-math20-proposal.html Yet another math 2.0 proposal] Lieven le Bruyn, February 11, 2009. * [http://gowers.wordpress.com/2009/03/10/polymath1-and-open-collaborative-mathematics/ Polymath1 and open collaborative mathematics] Tim Gowers, March 10, 2009. * [http://maxwelldemon.com/2009/03/14/polymath/ Polymath] Edmund Harriss, March 14, 2009. * [http://science.slashdot.org/article.pl?sid=09/03/18/194228 Massive open collaboration in mathematics declared a success] Slashdot, March 18, 2009. * [http://michaelnielsen.org/blog/?p=581 How changing the technology of collaboration can change the nature of collaboration] Michael Nielsen, March 18, 2009. * [http://michaelnielsen.org/blog/?p=584 The polymath project: scope of participation] Michael Nielsen, March 20, 2009. * [http://gowers.wordpress.com/2009/03/24/can-polymath-be-scaled-up/ Can polymath be scaled up?] Tim Gowers, March 24, 2009. * [http://whatisresearch.wordpress.com/2009/03/24/concluding-notes-on-the-polymath-project-and-a-challenge/ Concluding notes on the polymath project - and a challenge] Vilpulniak, March 24, 2009. * [http://michaelnielsen.org/blog/on-scaling-up-the-polymath-project/ On scaling up the polymath project] Michael Nielsen, March 25, 2009. * [http://numberwarrior.wordpress.com/2009/03/25/a-gentle-introduction-to-the-polymath-project/ A gentle introduction to the polymath project] Jason Dyer, March 25, 2009. * [http://terrytao.wordpress.com/2009/07/22/imo-2009-q6-mini-polymath-project-impressions-reflections-analysis/ IMO 2009 Q6 as mini-polymath project: impressions, reflections, analysis] Terence Tao, July 22, 2009. * [http://polymathprojects.org/2009/07/27/selecting-the-next-polymath-project/ Selecting the next polymath project] Terence Tao, July 27, 2009. * [http://blog.jonudell.net/2009/07/31/polymath-equals-user-innovatio/ Polymath equals user innovation] Jon Udell, July 31, 2009. * [http://www.nytimes.com/projects/magazine/ideas/2009/#m Massively Collaborative Mathematics], Jordan Ellenberg, The Ninth Annual Year in Ideas, New York Times, 2009. * [http://mbarany.com/publications.html#WikiSymPolymath `But this is blog maths and we're free to make up conventions as we go along': Polymath1 and the Modalities of `Massively Collaborative Mathematics.'] Michael Barany, Proceedings of the 6th International Symposium on Wikis and Open Collaboration, Gdansk, Poland, 2010. * [http://www.cs.cmu.edu/~jcransh/papers/cranshaw_kittur.pdf J. Cranshaw and A. Kittur. The Polymath Project: Lessons from a successful online collaboration in mathematics]. In Proceedings of the Conference on Human Factors in Computing Systems, Vancouver, BC, Canada, May 2011. * [http://www.newscientist.com/article/mg21028113.900-how-to-build-the-global-mathematics-brain.html How to build the global mathematics brain], Jacob Aron, New Scientist, 4 May 2011. * [http://www.newscientist.com/article/mg21028112.900-mathematics-becomes-more-sociable.html Mathematics becomes more sociable], New Scientist, 5 May 2011. 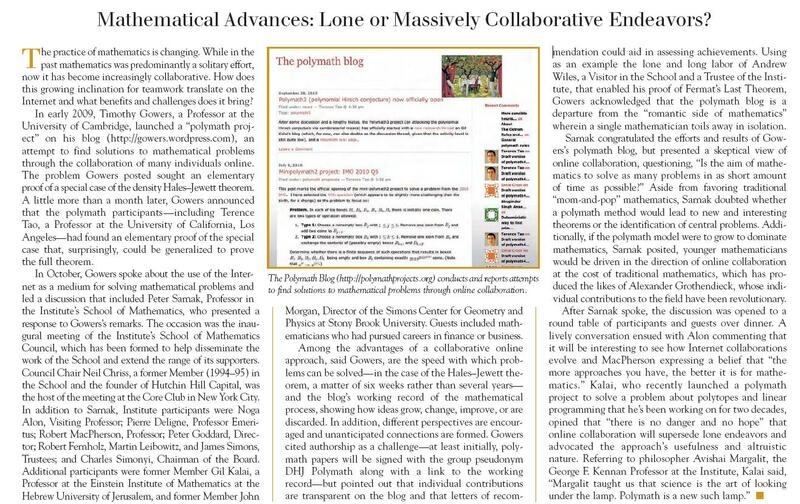 * [http://polymathprojects.files.wordpress.com/2011/03/polymathias.jpg Mathematical Advances: Lone or Massively Collaborative Endeavors?] from IAS Institute Letter for fall 2010 based on a discussion organized by IAS fall 2010. * [http://today.uconn.edu/blog/2010/10/will-crowdsourcing-revolutionize-scholarship Will ‘Crowdsourcing’ Revolutionize Scholarship?] An article in UConn Today by Jeremy Teitelbaum, Fall 2010. * [http://online.wsj.com/article/SB10001424052970204644504576653573191370088.html The New Einsteins Will Be Scientists Who Share] The Wall street journal, October 2011. * [http://www.nature.com/news/parallel-lines-1.14759?WT.ec_id=NATURE-20140227 Parallel lines], editorial, Nature 506, 407–408 (27 February 2014).